Tufo's best selling road racing tire. The narrow tire profile minimizes head on aerodynamic resistance. The high inflation pressure lowers the rolling resistance significantly. Black, yellow, red/yellow. Size 700x19 (195g), 700x21 (215g) or 650x21 (200g). 145-220 psi. This is a light weight yet durable tire with good handling characteristics. I mostly ride it on good condition rural roads. I've been using this model tire for over fifteen years. I keep riding them well after the colored underlayment begins showing and typically get eight thousand miles on the front and four thousand miles on the rear. Great tubular AND it is puncture resistant! I have ridden sew-ups or tubular tires since the 1980s. These are the most durable, puncture resistant tires I've ever ridden. They are slightly more expensive than the comparable low-end tire, but they pay for themselves over the long run. They have a slightly harder road-feel than the high end tubulars, but I am not a racer and can't justify the price. Rolls nice. Smooth and fairly fast. Thin rubber makes it light, good for climbing. Grip is reliable. More confident on desends. Punctured once front and back but sealed with stans and rode on them until worn. Con wears out quickly due to thin rubber. deponds on your weight, tire pressure and the asphalt. ( I am 166lb, I pump to 130 PSI). My rear tire worn out around 1000 miles and started showing the threads. I replaced it with another. Front is ok at 1500 miles. probably around 2000-2500 miles both needs to be replaced. Good tire for racing, but for training it is an expensive investment. I have used these tires for a couple of years and they are terrific. I use these tires for racing and training. I am a big fan of Tufo tubular tires, riding them on the track and for cyclocross. They are well-built, and in the case of the S3 Lite they are lightweight. Never had any trouble with these tires, unlike some other traditional tubular tire brands who have trouble with their skinwall casings. Don't hesitate! Buy these tires! A great tire that takes rides as smooth as those twice its cost. Bought 650c for my wife's bike and she can't believe how responsive they feel. A great tire and a great value. I have the 21mm Tufo S3s mounted on Easton EC90 SLX wheels. These are a great combination for climbing, even for an old guy like me. If you match these tires with a low weight wheel set you will LOVE what you have. My combination are mounted on a Look 585 wDura Ace 7950 Compact and 1128 rear cassette. The full bike weight is just over 13.5 lbs. I run the Tufo's at 175 and they ride better than the 21mm Zipp Clinchers on Zipp 404s I have on my other Look 585 running at 130. The only compromise you make with these low weight tires is wear life. I got 1,500 miles out of my first set and have already installed another set. The extreme performance is worth a few less miles of wear!!!!!!!!!! I run these as my race tires on my tri bike. I have have never flatted, and they will hold air for a month or more. They are very light too. Great racing tire. Really stable with a low rolling resistance. Although I replace them every so often, I have yet to puncture. The best tubular tire I've used in 25 years, long lasting, long rolling, road savvy, dependent. All around road use on all three bikes I own with very few punctures and a lot of miles in the saddle. No problems at all. What a pleasure return for the money. easy to install with TUFO tape. i ride with 160 air and find it comfortable for my training rides. 650cc R hard to come by. I use tufo tires for every ironman race. And, I am never on the side of the road fix them. Invest wisely. This is a fast race tire that is not bad on the budget. It seems to last pretty long for a high performance tire. I've been using Tufo tubulars for over 10 years now, I tried the rest, i.e Vittoria, Hutchinson, Giro etc. 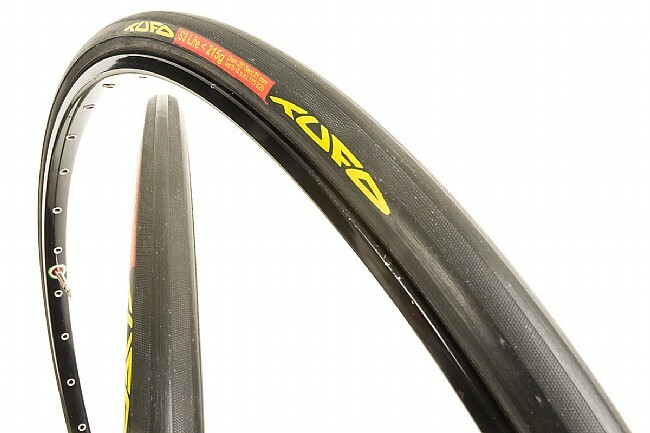 and Tufo is far and away the best tire in my opinion. It has the best resistance to flats and combined with low weight and good price, they can't be beat. I usually get around 3000 miles out of a rear and around 5000 miles out of a front before the tread is worn through unless I hit something really nasty and flat out and if the hole is small enough, I use the tufo sealant to get some extra miles out of the tire before it becomes land fill material. I live in southern N.H. and ride year round so I am up against some pretty nasty stuff between the potholes, sand and salt and other debris on the road they do an amazing job for me. I will use nothing but Tufo on my 3 bikes. I was very pleased with my buying experience. These are my favorite tires. Please keep it a secret!! I've been running S3's for 2 years now, I've had maybe 4 flats and didn't even know about any of them until later when I saw the sealant on the tread or the pressure was low. (I run the red ones now - easier to see the sealant) Tufo knows what they're doing, their sealant works and the mounting tape is simply fantastic. For such a light tubular, the S3 is amazingly tough, the last two I've changed were worn out, the red was completely gone off the tread. The combination of very light weight, high pressure, and a very narrow portion of the tread touching the road, make these blazing fast, plus the security of a glued-on tire, excellent puncture resistance, and Tufo's superb sealant. And even if you do get a bad cut that won't seal, you can actually ride these totaly flat without damaging your carbon rims. I'm not a racer but bought a pair (215 gm 21mm) anyway out of curiosity. I've been riding on Tufo S33 Specials. I had to use the S3 Lite on the rear wheel because I lost my front S33 to sidewall puncture. Currently I have an S3 Lite on the back (Tufo Extreme tape) and S33 Special on the front - probably not an ideal setup. I rode my first 10 miles expecting it to flat the first 100 yards because S3 Lite looks so thin and light compared to S33 Specials but so far no problems. Comparatively this tire feels much smoother and easier to accelerate. I really enjoyed the ride. Tufo knows what they're doing. The installation was a snap. For tire dismount, heat gun at low setting makes removal procedure easy. 25 of 25 customers found this review helpful. My top choice race tire. Great race tire. Good road adhesion. I have these tires on two of my carbon race wheelsets. I have had a few flats from cuts but most can be repaired w a few drops of the extreme sealant. I wouldnt train on them because I ride 10,000 plus miles a year. If you want a great training tire try the TUFO C s33 special same ride quality but more durable and greater mileage.